"Free" traffic for your rehab or outpatient drug and alcohol treatment facility. The trouble is that it takes time and effort and likely some budget too. That said, SEO isn't rocket science or magic. It can be done. 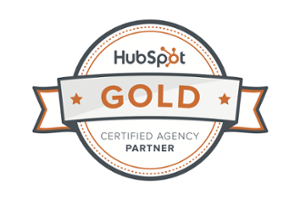 Let's get you on the road to SEO success for your addiction treatment center! I'll spare you the rest of the list! With all of these considerations, it's hard to know where to get started and what you can do right now to improve your position for keywords like "addiction treatment near me," "outpatient heroin treatment center," and "rehabs in (fill in the blank city)." Note: this is almost always my first step with anything digital marketing. Your website is your home base and you own it. You don't own Google Maps, you don't own Facebook, and so those services or the rules they play by can change at the drop of a hat. Page titles and meta descriptions matter. The former for SEO and the latter to get more clicks when someone sees your website on a search engine results page. Here's some food for thought: are you using the words that your prospective patients use or are you using words that you prefer as a brand? I'm not saying that you should perpetuate words that you believe stigmatize people with addiction or cheapen the work that you do, but I am saying that while Google is good at understanding synonyms you are going to get vastly different search results for "medication assisted treatment for opioid addiction" versus "subs for a heroin addict." The first phrase sounds like a panel discussion at a SAMHSA conference and the second is someone who needs treatment. Different treatment centers are going to come to different conclusions here, but factor in who your targeted audience is, what we call a buyer persona, and what they would type into Google as part of the decision making process. Speaking of your buyer persona, they just might be searching for addiction treatment services on mobile, so keep your title and meta description short. Best practices are always changing, so check out this always up to date guide for title optimization and meta description optimization for specific character limits. Another key to on page local SEO optimization is, wait for it, including your name,address, and phone number at appropriate places on your website. Common places include your footer, contact us page, location page, and your about page. This is a surprisingly common opportunity to optimize your addiction treatment center site. If you've already got this covered, the next step is to use schema. What's schema? Google is really good at generating relevant search results, but hasn't been so good at understanding the context. Google may see a bunch of words on your rehab website and identify some keyword phrases, but you and I would know it to be a review from a patient who is on the road to recovery. You can use schema to tell Google that those words are a review, or that your treatment center name is a business, and so on. Kudos to Joe Hall who put together this handy schema generator. Depending upon what CMS you use for your website, there are plugins and extensions available that make schema accessible for the non-techie as well. If you've made it this far, let's switch gears and take steps to optimize your Google My Business page. Google is always updating the features available on Google My Business. When you have verified and published your Google My Business page, three important things happen: you show up in Google Maps, in the local pack on some search engine results pages, and also in the knowledge graph mostly for branded searches. 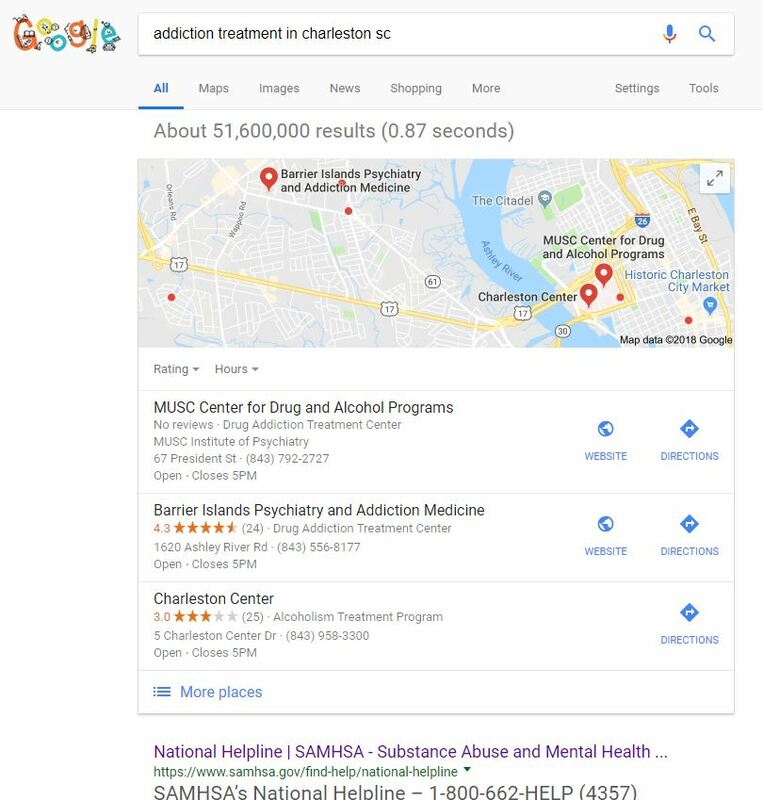 You'll notice in this search engine results page for "addiction treatment in charleston sc" that of three top results one doesn't have any reviews, another with more than four stars, and the last listing has three stars. While this is proof that you don't need reviews to rank for a competitive term, it can only help and good reviews will increase the percentage of people who see your listing and then pick up the phone and call or otherwise convert into a lead. Another fun fact is that if you prepend this same search with "best," you wouldn't see the first or third result. Google only shows local businesses that have four out of five stars or more when searchers are looking for the best. Moral of the story: ensure that your successful patients know that they can help others by sharing their experience online. Organic SEO is a different animal than local SEO. It refers to optimizing your content for search terms that are location independent. What treatment options does an alcoholic have? How can I afford drug treatment? Addiction treatment terms can be outrageously competitive in organic search, so who should commit the time and energy to make it work? If you have a regional or national footprint, the answer is yes. Organic SEO will help you demonstrate thought leadership and build your brand. If you can count the number of locations you have on one hand, organic might be tough but write this content anyway. Here's why: your prospective patients have questions and the more answers that you have to those questions, the more likely they will ultimately will get treatment at your facility. Let's say someone searches for "alcohol addiction treatment near me," finds you in the local pack, and clicks onto your website. Everything makes sense as far as your services are concerned, but the searcher wonders whether you take his insurance... and crickets. Your website doesn't say anything about what insurance you take. Unless the prospect is dead set on your treatment center, they're very likely to hit the back button and check out another website or search again this time referencing their insurance provider. To make a long story short, you don't need to rank at the top of Google for your content to help meet your census goals. Search engine marketing success starts by realizing that Google's goal is to provide the most relevant and authoritative content for whatever the searcher is inquiring about. We (digital marketers) are quick to talk about ranking factors and deconstructing algorithms, but truth be told, if you start with this premise you'll produce content that Google wants featured in their search engine results. So what would Google look for if it's trying to find the most relevant and authoritative content that provides a good experience for its users? A lot of this is within your control. You're a subject matter expert in addiction treatment especially in your community. Tell prospective patients what they need to know, do it well, and keep doing it. For every hour that you spend creating the content, whether it's video, audio, or the written word, spend twice that, heck, spend five times that promoting it. Otherwise, you'll be shouting into the wind. Some people will see the content that have come to your site through other means and are looking for more, but you'll get a lot more traction with content if you take the time to let people know about it. Here's some tips to get the most out of these promotion tactics. The lifespan of content on social media is pretty short. Don't be afraid to share your content multiple times over the course of days, weeks, or months. We continue to share our own evergreen content for at least a year after publication! Paid advertising is a big world. Facebook ads are usually a good bet, but there's also other social media networks and native content advertising platforms like Outbrain. If you know the local websites that your buyer persona is on locally, reach out to them about a sponsored post. Cross post your thought leadership posts on LinkedIn Pulse. You can also add links to your Google My Business profile. Ideally, you have a local network of related companies and organizations that will link back to your content. Those local links from reputable sources are exactly what search engines want to see. Don't be afraid, though, to reach out to people that you don't know. You need to be persistent, but the reward is awesome census numbers and more changed lives. And you thought this post was going to be about search engine optimization for the addiction treatment industry? To cover SEO we just can't ignore content marketing, technical SEO, and promotional strategies. Stepping back even further, this is all part of a digital marketing strategy called inbound. Inbound marketing is the process of attracting, converting, closing, and delighting your buyer persona. We've written an introduction to inbound marketing, and if you're interested in SEO, it's worth learning more about inbound. To get instant access to the no obligation guide click below!